Start reading Thrive on your Kindle in under a minute. 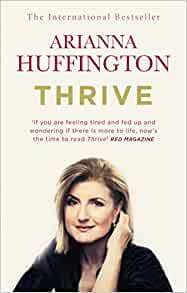 ARIANNA HUFFINGTON is the co-founder and editor-in-chief of the Huffington Post, a nationally syndicated columnist, and the author of thirteen books. She is also the co-host of the US radio show Left, Right & Center. She was named to the Time 100, Time magazine’s list of the world’s one hundred most influential people, and to the Financial Times’s list of fifty people who shaped the decade. Originally from Greece, she moved to England when she was sixteen and graduated from Cambridge University with an MA in economics. I genuinely thought this book would inspire given the great reviews. It did not inspire me. The style of writing was irritating - a mix of journalistic and academic writing that seemed to pluck evidence from random studies and surveys to justify every point made. The barriers to change for an ordinary person were not acknowledged, and there were few practical steps recommended to achieving a thriving life. The vast majority of people who are failing to thrive are either in poor relationships they feel unable to change, in jobs where they work too hard for too little pay, with debts and childcare they seem unable to afford or with ill health that is not getting better. It is difficult for people in these situations to instantly get a job in a company that allows pets, has meditation rooms or yoga classes, or to take the time and finance required to change their lives. All of this is ignored, as if the reader is in an ideal practical position and simply has to join a yoga class! Changing behaviour is not about evidence of what works; it is about taking the small steps towards a healthier life, and finding ways of overcoming the barriers to do so. I saw Ariana on Super Soul Sunday (Oprah Winfrey) and thought she was an incredible lady. I loved and resonated with her story and purchased this book once her interview finished. She truly is an inspiration and delivers a message that we should all hear. Definitely a feel good book that will make you feel more positive and motivated! A great read! A great role model! Fantastic read and brilliant real and down to earth content. Arianna writes inspirational stuff about the third metric.I loved every chapter and resonates strongly at every page turn. You will learn heaps and identify with many of the references. Loved it. 5.0 out of 5 starsBetter equipped for a life with devices. A holistic view to life with essential technology; including how to switch off. Enjoyable and interesting read. I can't lie, I found this a bit dull. I really like Arianna Huffington and have seen her speak live - she was excellent. But this was just a big dull. 4.0 out of 5 starsGood read, inspirational! Good read, inspirational! Does drone on a little but it's quite a motivational and inspirational read.